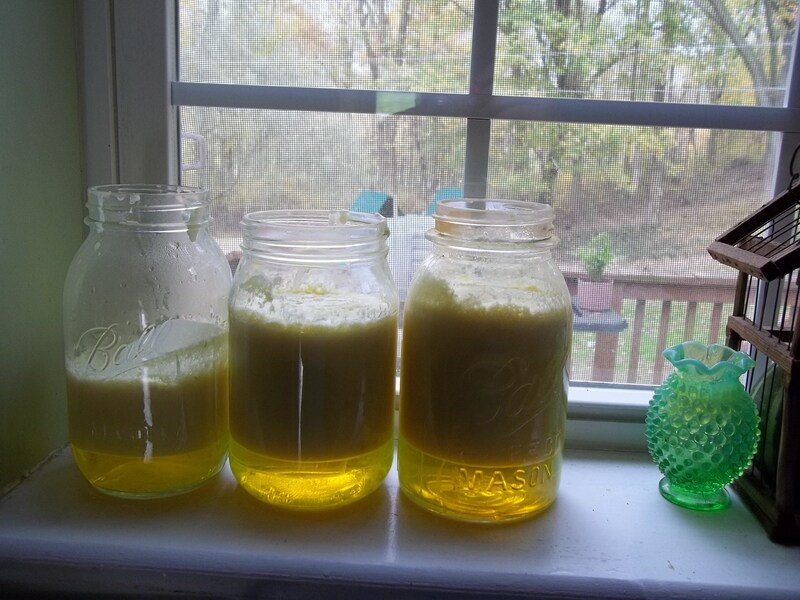 One of my very first posts as a blogger was a recipe for homemade laundry detergent. 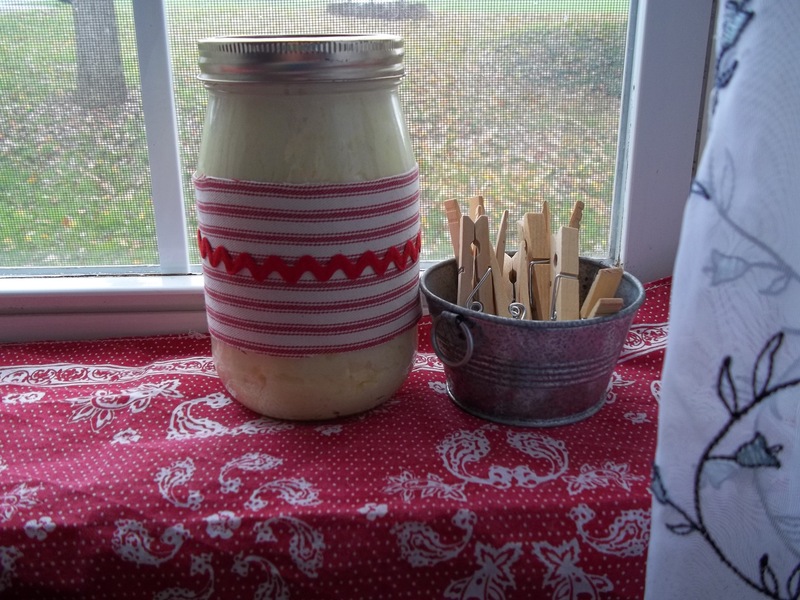 I still love it and recommend it, but I came across an intriguing recipe for homemade laundry mousse a couple of weeks ago that I wanted to try. Actually, I just used up the last of my liquid, so it was perfect timing for me to try making this kind. The ingredients are all the same, it’s just putting them together in a slightly different way. The texture of this recipe is kind of creamy, almost like a paste. It actually reminds me of whipped butter in appearance and has a fresh smell that I love. 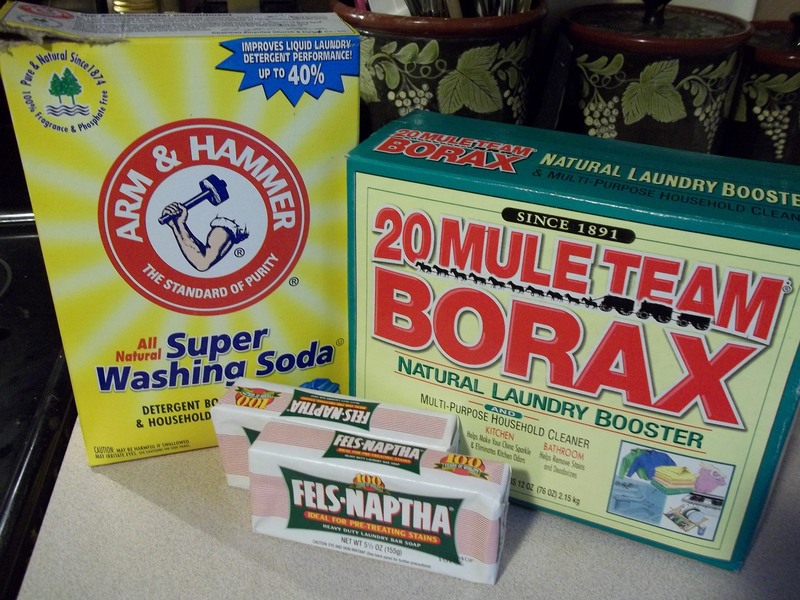 I get all of my ingredients at an Amish Dry Goods store that is local, but you can probably find these at WalMart or your grocery store in the laundry aisle.Washing soda is slightly different than baking soda, so just be aware of that before you start. The first step is to take a large saucepan and heat up 6 cups of water in it. In the meantime, grate the 2 bars of Fels Naptha soap and pour them in the water. Heat to almost boiling until your soap flakes are dissolved. 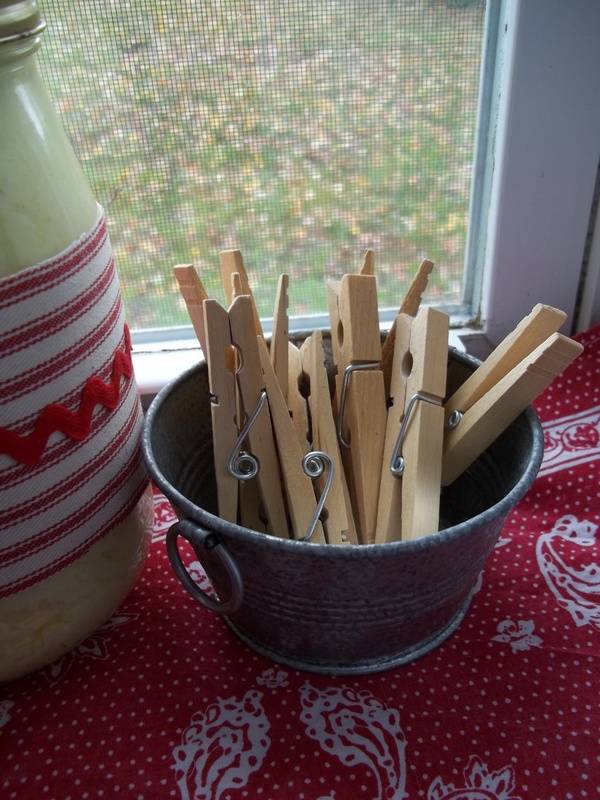 Add the Borax and washing soda and stir for about 3 minutes. 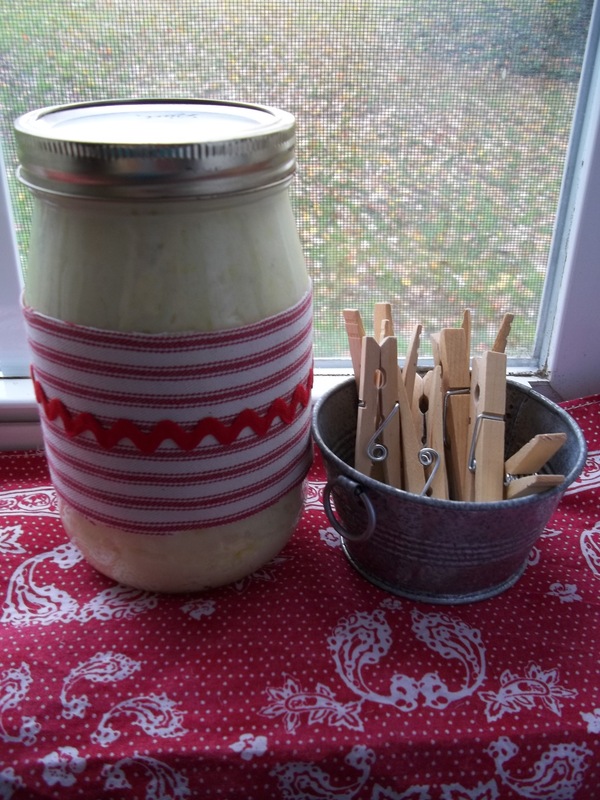 Remove from heat and pour into quart sized mason jars (wide mouth), leaving about 1 1/2″ at the top. Let this mixture sit for about 8 hours or more. As you can see, the mixture does separate as it sits. After this, pour the contents of each jar (do one jar at a time) into a blender and whip it up. On a personal note, I found it easier to pour all of the liquid portion into the blender and then bits of the solid (top) part in gradually. I actually added in some extra water too. 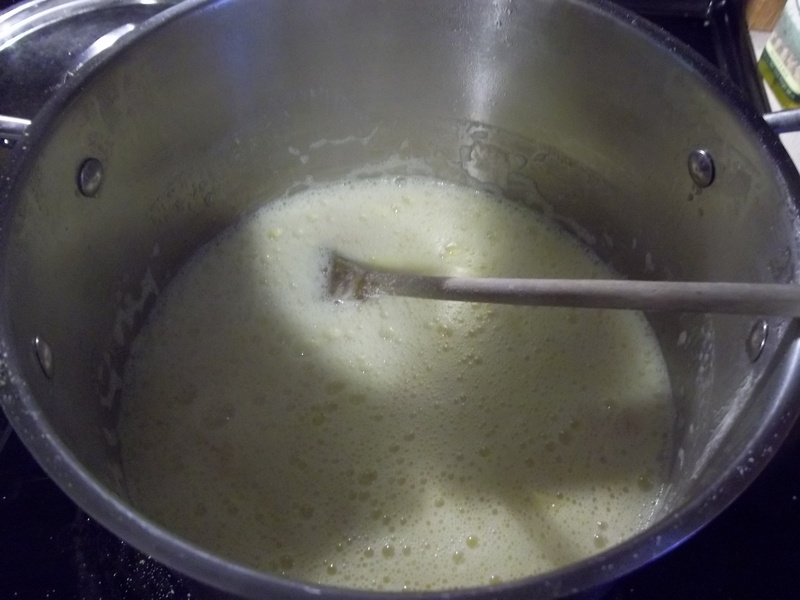 Eventually you will get a nice creamy texture like I noted earlier. It almost looks good enough to eat–but please don’t, unless you need to wash your mouth out!! 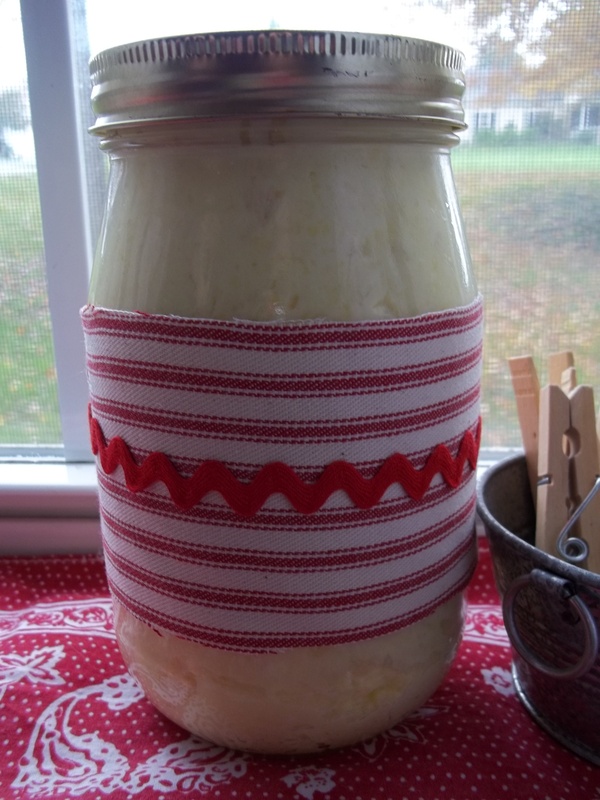 Pour everything back into jars or another kind of container with a lid. Use 2 TB a load. This recipe looks so interesting to me. I have seen the powder version and even the liquid. I have an HE machine so I am wondering if this will be safe in it. Cool tutorial. My washer is newer & uses very little soup like Kim I wonder if it will work in it. What kind of washer do you use it in? I have the older style top loading. I’m sure you could try it, just a smaller amount. I’ve been really pleased with the results so far. I haven’t made this mouse version, just the powder version. (will be trying the mouse version for sure!) Yes it is actually recommended for the newer front loading washer because it is very low sudsing. Great results!! I make my own powdered detergent, but I think I might try this for a change next time I’m out. Thanks for sharing! I JUST bought all these ingredients to make some liquid laundry detergent, but I think I will do this one instead! For top loaders, do you still put the mousse in the dispenser at the top of the machine, or put it in directly with the clothes? I put it in directly with our clothes. What is the difference in the washing between this and the more liquid version? Have you noticed? @Shiloh–I’ve not noticed any major difference. Actually, I’ve been using less than what I originally recommended and it still works great. Laundry mousse? That sounds so nice! I am pinning this one. If I can track down some Fels Naptha, I’ll try it! LOVE this idea! Probably saves so much money! And it looks pretty cute as well. 🙂 I am so happy you shared this @ Show & Share, thank you!